Protect your loved ones while traveling. Innovative, no false alarm microprocessor technology. Easy, one touch testing. Designed for the rugged RV environment. 046A current draw. Detects LP gas/propane and natural gas. Fully Operational Mute - Mute does not override detection, giving you full time protection. InteleCheck Circuit - No false alarms from aerosol cleaners, hair spray and other flammable gases. Micro Current Technology - Saves precious battery power. Long Life, Self Cleaning Sensor. 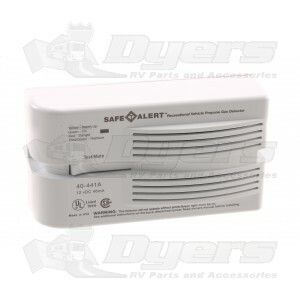 Loud 85 dB Alarm - Alerts you to the presence of hazardous propane vapors. Test/Reset Button - Used to temporarily silence alarm during ventilation. Tests all the detectors functions with one touch. 46 milliamp (.046 amp.) current draw. Operational Temperature Range: -31°F to +150°F (-35°C to +66°C).